"Soya" is a product of the soybean which is a type of lequme. Soybeans can be made into soya flour, soya milk, tofu and oil and is widely used in the food-processing industry. It is also a common food allergen. Over the last thirty years or so, soya has crept into everyday foodstuffs, mainly in the form of soya oil (in tinned tuna fish, vegetable oil, and margarines), soya flour (used extensively in bread making), soya beans and textured vegetable protein (meat substitutes). In fact, up to 60 per cent of processed foods contain soya, for example, bread, biscuits, pizza and baby food. In the majority of cases, this is in the form of soya isolates, which are not derived from whole soybeans. Avoid any soya products made from soya protein isolate as the process used to produce them can result in a 'food' that no longer resembles the original soybean and can also contain traces of aluminium and nitrates. The best way to tell whole soya from soya isolate product is to check the ingredients list with the allergen warnings. However, how clear are the ingredients in the ingredient list? You almost need to be a private detective just like Hercule Poirot. According to a study by Asthma and Allergy Foundation of America, it has been observed that soya allergy is the ninth most common allergen. The body's immune system mistakes the harmless protein found in soya for a threat and releases histamines, a naturally occurring chemical, for protection. However, this can cause an allergic reaction. Although having a soya allergy can occur at any age, a soya allergy is more common among children. Soya depletes the body of several vital minerals and vitamins in that a child needs during their growing period. Soya is classed as a complete protein because it contains all the essential amino acids. However, organic soya foods are considered to be preferable because they are not genetically modified. 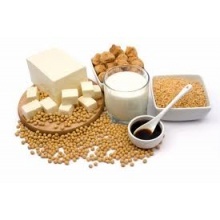 It is also best to eat soya as it is traditionally eaten by other cultures, such as the Japanese, in the form of tofu, miso, soya sauce (tarmari is wheat free) and tempeh. For many people, soya allergy is not serious but it is uncomfortable. After consuming any food containing soya, symptoms may not be seen for several hours or they can manifest themselves within a few minutes. The signs of soya allergy can be mild but may lead to a life threatening allergic reaction like anaphylaxis. Anaphylaxis is a severe allergic reaction caused by ingesting soya, although it is rare. It's more likely to occur in people having asthma or an allergy to other foods such as peanuts. Anaphylaxis symptoms include loos of consciousness, rapid pulse, shock and dizziness. One of the simple treatments of soya allergy is to completely avoid soya and products containing soya. Familiarise yourself with the ingredients carefully before purchasing any product. If you are a chef make doubly sure that the all the ingredients that you use in a recipe are suitable for someone who has an allergy to soya. In case of a serious allergic reaction an emergency injection of adrenalin should be administered.